Simon Clark - Taking Liberties - With friends like Kate who needs enemies?!! With friends like Kate who needs enemies?!! Great to see the IEA's Kate Andrews on Sky News the other night venting unbridled anger at the Lancet's ludicrous campaign to turn us all into vegans. What a pity, though, that 'liberal' and free market commentators like Kate (above) now reserve all their righteous indignation for attacks on alcohol, sugary drinks and 'junk' food. "To treat food like tobacco, to any person listening out there, is genuinely baffling." "To compare a treat or a meal out or a hamburger to smoking a cigarette ..."
The only thing missing from the end of that sentence was a full-throated "Ugh!". Yes, I know she was talking about the relative health risks but implicit in Kate's reaction was an abhorrence of tobacco, as though smoking a cigarette is something unfathomable to ordinary people. I'm familiar with the tone because many vaping advocates, including some ex-smokers, adopt it when they're comparing e-cigarettes with traditional cigarettes. I don't disagree with Kate that there is a significant difference in risk but it saddens me that she has apparently accepted every ounce of propaganda about smoking which is now seen as just about the worst thing you can do if you want to stay fit and healthy. Health is incredibly complicated. Take my father, for example. He didn’t smoke, he drank in moderation, was never overweight and was far fitter than me for much of his life, yet needed triple heart by-pass surgery at the age of 58 and again a few years later. He subsequently had a full heart transplant. I am almost 60. I am not a smoker but I am officially obese and last year I was told that unless I take statins every day for the rest of my life there is a strong chance I will have a stroke within the next ten years. I don’t dispute that smokers put their health at risk - though almost all smoking-related illnesses are multifactorial and many smokers live to a ripe old age without succumbing to poor health as a direct result of their habit - but so do people like me who take little or no exercise and allow themselves to become overweight. Genetics are a factor too which is why I don’t accept the argument that people have a ‘right’ to good health. Meanwhile history shows that by throwing tobacco (and smokers) under the bus you simply create a template for attacks on consumers of other 'unhealthy' products – the so-called 'slippery slope' that Kate was talking about. Instead of meekly accepting each and every argument against smoking, commentators should be challenging some of the more outrageous claims – the suggestion, for example, that 'every 15 cigarettes smoked causes a genetic mutation' or that 'passive smoking kills 600,000 a year, including 165,000 children'. When did you last hear even the more liberal commentators criticise the punitive levels of tobacco duty that hurt consumers far more than the current tax on sugary drinks? Throwing in the towel on smoking – even when the evidence is sometimes questionable – has led directly to what Kate was justifiably angry about when reviewing the papers on Monday night because it has emboldened public health activists to turn their attention to food and drink. The food and drink industry’s attempt to distance itself from tobacco - including, on occasion, refusing to share a platform with tobacco companies - is already proving to be a gross misjudgement because it has given momentum to public health zealots. While some of us were fighting graphic health warnings, the display ban and plain packaging, what was the food and drink industry doing to protect both its long-term interests and consumers who believe in choice and personal responsibility? Did senior executives not realise that once activists and politicians had acquired a taste for such policies, tobacco was only the start? “Drawing a comparison between tobacco and food is deeply irresponsible. Food and drink are essential to sustain life while even the smallest dose of tobacco is harmful to health." He’s absolutely right, although I defend every person’s right to eat and drink whatever they damn well choose without excessive regulation or, worse, prohibition. So, no offence Kate, but with friends like you (and the food and drink industry), who needs enemies?!! These so called libertarians, who I once admired very much, have lost my respect because they are happy to throw smokers under a bus to save the things they like. I hate them all. None of them are our friends. All are hypocrites who believe in their own form of liberty and not liberty for all. I have never seen a study into smoking and health (where the samples were randomised) that shows that non-smokers have fewer diseases than smokers (including cancer). In fact I have only found one study that succeeds in eliminating selection bias, this one and it is hardly a great advertising tool for the tobacco control industry. If you expose animals to tobacco smoke under laboratory conditions the smoke exposed animals live longer than the animals that are not exposed to smoke. So on earth does everyone just blindly accept that smoking is risky? If the tax were were removed from tobacco bang goes the obesity "epidemic". It is just baffling. Fredrik, I don’t think it helps our case to deny there are serious health risks associated with smoking. There is a strong statistical correlation, for example, between smoking and lung cancer although it is also true that you don’t have to be a smoker to get lung cancer. My argument is that the risks of smoking (including social smoking and ‘passive smoking’) are often exaggerated to scare people to quit and we should challenge the more extreme claims rather than blindly accepting them. Smoking is a risk I would compare to Russian roulette. The point is, adults should be free to make an informed choice without being denormalised or worse, and while the potential risks from smoking may be on the high end of the scale, it’s still a legitimate choice that must be defended. Yes, smoking is correlated with lung cancer in the UK 15% of lung cancer occurs in never-smokers and they currently make up 52% of the population. This does not, necessarily, mean that smoking causes lung cancer (by some yet to be identified mechanism). 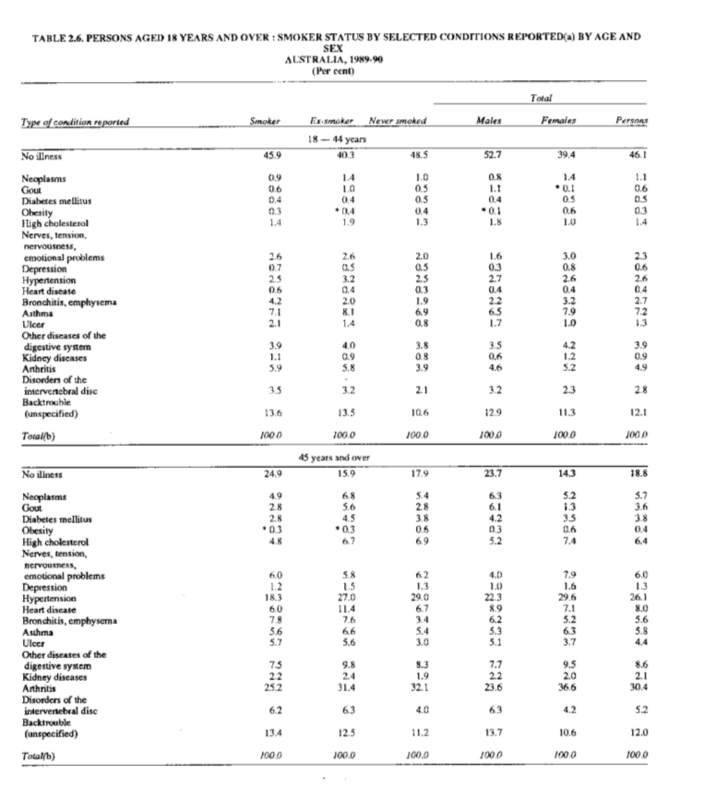 I think the really important point is decades of anti-smoking policies have clearly had zero effect on lung cancer death rates as can be seen by comparing countries like Russia and Ukraine (where smoking prevalence remains high to this day) and countries like the US where millions of people gave up smoking over many decades and lung cancer trends follow the same pattern regardless. This is billions of subject years of evidence which is simply ignored. This is much stronger evidence that a few millions of subject years that the anti-smoking industry can come up with to back up it's case. I have tried to point this out on the wikipedia section on lung cancer but they say it counts as original research so the evidence is not allowed. I think that comparing smoking to russian roulette is simply bizarre, and a strange thing for a smokers right advocate to say, Simon Chapman yes, Simon Clark?!. I once asked Simon Chapman whether he would rather spend many decades enjoying smoking or play russian roulette once - he never responded. And I think the vast majority of people would make the sensible choice of many decades of smoking. I do take your points but I find it so frustrating that the anti-smoking industry seems to have such a strangle hold on the scientific process that all evidence to the contrary of what they want is simply ignored. The risks associated with smoking are as exaggerated as the risks of eating junk food, which libertarians point out while not accepting that over the decades there has been the same use of junk stats, propaganda and scaremongering on smokers as there is on food such as cheese being as addictive as crack cocaine - or smoking being as addictive as heroin. Sadly, those exaggerated risks of smoking are not just used to force people to quit but to get others to attack, marginalise, and exclude smokers and abandon any liberal views on the right to leave people alone to enjoy their lives. DR : do you smoke?" ME : yes, although these days to admit it is like wearing a yellow star - especially in places like this"
ME: "yes, check this appointment letter that otherises smokers who are not referred to as patients but "others who smoke."" DR :"How long have you smoked?" Dr checks my DOB :"blimey, that's a long time." ME :"yes, since I was 8. I do not say that to shock or brag but that it is a fact of life for my generation and now I fear quitting completely could be more harmful to me personally than smoking moderately." DR: "Yes, I agree, you are probably right in your thinking." ME :"so what about my weight?" DR : "believe me you are better off as you are. Your health would be at greater risk and you would come to more harm if you were obese so stay as you are. See you in a few months time if you feel a need to come back otherwise cancel the appointment when it comes through." Suffice to say that thanks to Tracy Brabin, and the intolerant management at hospital which doesn't describe smokers as patients, my appointment has been cancelled. Btw, you may remember way back just before the ban came, I wrote you the life and times of a dedicated smoker. You may recall I mentioned in that article that if smoking was banned in pubs, cafes and restaurants then perhaps next restaurants etc would be told what they could put on their menues. It looks as if I wasn't far wrong. I believe the risks associated with smoking depend on each person but individuality or diversity no longer exists or is respected these days if your diversity is not the norm. The young Libertarians like Ms Andrews may believe that everything is safe except for smoking but let us not forget that some of us have been smoking longer than she has been breathing air so perhaps she could open her mind a little but to how exaggerated the risks really are. We are not given real research. It is not OK to throw smokers under a bus to win other libertarian issues that are only issues because of what was done to smokers first. They say we are impotent and ugly. But if we are lucky enough to find a partner we are infertile. But if we are lucky enough to have babies we will kill them in the womb. But if our babies are lucky enough be born we will kill them in their cots. But if we are lucky enough to not kill them in their cots we will make them grow up to be ugly impotent smokers. And when they are smokers our children will kill the people they work with, kill the people they live with. And because of this we must not be able to adopt children - forbidden. And because of this we must be denied operations for no clinical reason. And because of this we must have our pubs and restaurants abolished. We must not be seen near hospitals and schools. They tell us that smoking causes lung cancer despite tens of billions of subject years that says otherwise. This is identity spoiling and all based on nothing more than statistics. I would say the abuse of statistics. It is scary that this is happening in our life times. It is wrong and it will not stop until these statistics are properly challenged but no one is challenging them so the anti-smoking industry is kicking at an open goal. They have been kicking at an open goal for decades. Hear hear to that last comment Fredrik. Hear, hear as well, Fredrik. The warnings on 'plain packaging' remind me of B-movie horror films containing ridiculous comedy gore. I find that it is so over-the-top that it makes the useful idiots who produce this schlock horror look utterly insane. You might have noticed that a pregnant woman who smokes is carrying a "baby" who may be "at risk" from tobacco smoke, but if you don't smoke, hey, it's not a baby, it's a "foetus" and you're allowed to murder it. The same journals that have been ramming healthism down our throats for decades also carry articles by supposed experts telling us why babies should be allowed to be murdered after birth, even when there's nothing wrong with them, not that this should make any difference. Don't we have strict equality laws for the disabled? Facts don't matter in pretty much anything these days, other than to be abused. And words don't matter much either. If you want to see change somewhere in society, simply change the definition of the word, such as 'marriage' or 'freedom' or 'rights' or even 'baby'. From the BMJ on why it's fine to murder kids: "Accordingly, a second terminological specification is that we call such a practice ‘after-birth abortion’ rather than ‘euthanasia’ because the best interest of the one who dies is not necessarily the primary criterion for the choice, contrary to what happens in the case of euthanasia." "Nonetheless... " and then come the excuses as to why they feel that kids should be murdered in cold blood. "Nonetheless" meaning that *despite* the evidence, they'll try to justify their twisted ideas anyway. That's "science" today - first comes the ideology and then come the massaged statistics and dishonest arguments and finally come new laws to put these people's sick ideas into practice. I think smoking might be better compared to skiing than to Russian roulette. Only a crazy person would play R.R., but even the biggest square might enjoy a cigar on his birthday. Absolutely, Simon. It’s what I’ve been saying for ages and have often tried to warn the drinkers about, but they just don’t want to hear it. It’s a very peculiar thing – more than just brainwashing – it’s almost as if the combined efforts of all members of the tobacco control industry have developed an almost complete blind-spot in the public, not just in terms of the exaggerations and spin about how terrible smoking is, but also a complete inability to see where their passive (or, sometimes, enthusiastic) acceptance of all the rhetoric will lead, or rather, is now leading. They honestly can’t see the connection, no matter how simply it’s explained to them. They genuinely think that refuting the exaggerated stories about the awfulness of their particular vice will be enough to stop the zealous campaigners in their tracks. They think that pointing out errors in the scare stories and offering alternative, contradictory stats will set the record straight. They simply have no idea what they’re up against. The Health Lobby is a powerful, well-funded and experienced beast which will swat them and their whiny protests aside like an irritating wasp. And they absolutely, categorically cannot (or will not) accept the part that they themselves have played in setting a trap designed to snare them, simply by “going along” with anti-smoking rhetoric. They still cling onto ASH’s body-swerve around the “slippery slope” question that “tobacco is uniquely dangerous.” A line, incidentally, that even ASH themselves no longer use! They have, quite simply, no idea what they have unwittingly set up for themselves and they still think they’re fighting a fair fight against fair people. They’re not. They’ve actually empowered a beast of huge proportions, and it’s heading their way. Fairness, reasonability, truth and compromise isn’t on its agenda. And all because they didn’t at least sit back and look objectively at what was happening to smokers. It’s easy to say that it’s because all the persecution heaped upon smokers doesn’t affect them and that it’s only really possible to understand persecution when it affects you personally, but if I can see a dangerous precedent coming which might affect me in the future (in respect of things other than smoking, that is), even if a present proposal wouldn’t do so – why couldn’t they? Well, looking at animal data, seems like 'junk food' is the risky option, not tobacco. In other words, give animals a diet rich in sugar and seed oils - a composition similar to most processed food - and you get obese animals with a reduced health and lifespan. Put animals under a lot of tobacco smoke for their entire lifetime (much more than humans usually smoke) and like Fredrik mentioned, they live longer and are healthier than non-smoking animals breathing hepa-filtered air. And remember, these were experiments optimized to harm animals, no to show any benefits from tobacco. I think it's very helpful to study recent history (1950s and on) to see how 'scientists' went after tobacco...because the same MO is used now for 'junk food' and meat. Impressive and eloquent arguments by all, especially Pat and Fredrik. Hear hear, I am silently cheering here in Canberra. The health cultist prohibitionist juggernaut misuses mortality rates to 'prove' preordained conclusions. 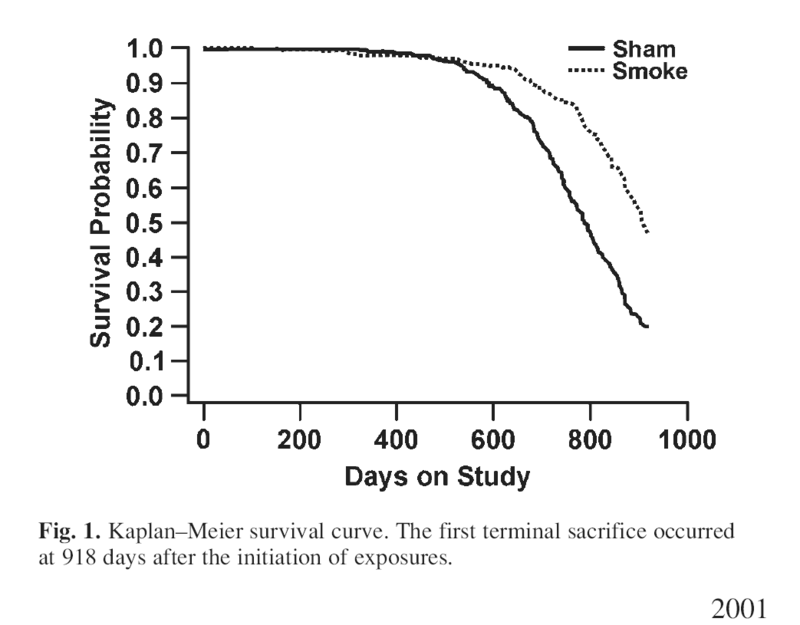 Probabilities are not absolutes, but are described as unavoidable certainty (SMOKING KILLS) in relentless anti smoking propaganda funded with money stolen from smokers. The outrageous tobacco 'related' mortality rates claimed by anti tobacco zealots are not real people, they are computer program projections. When the projections fail to match the prohibitionist ideology, they just decrease the statistical confidence interval. The meticulous Michael J McFadden conclusively proves such outright fraud in his fine work TobaccoNacht.